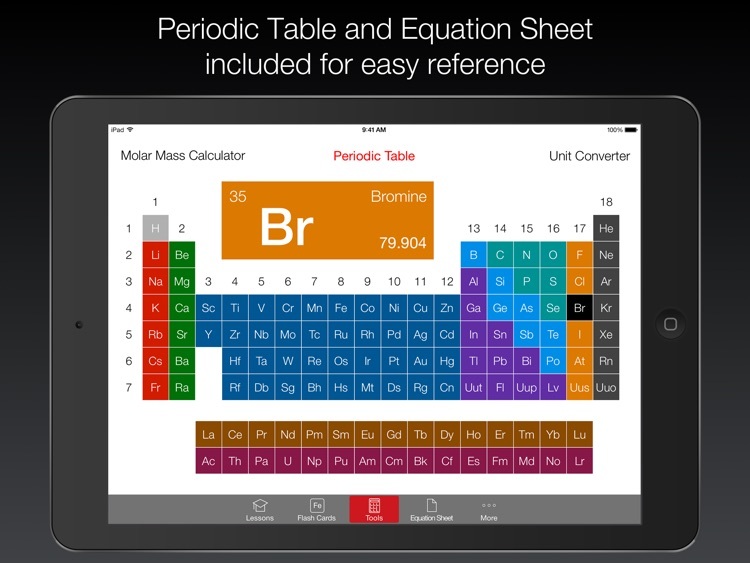 The best way to learn chemistry is back with a brand new version built specifically for the iPad! Introducing Chem Pro, the chemistry tutor on your iPad and the only resource you will need to excel in AP Chemistry or General Chemistry. 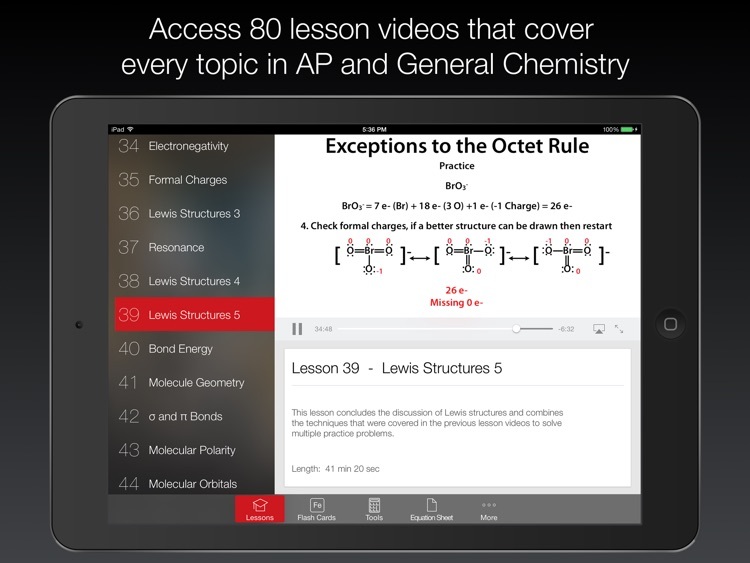 Chem Pro features an exclusive lesson library containing a total of 80 videos that cover the entire year of AP and General Chemistry. 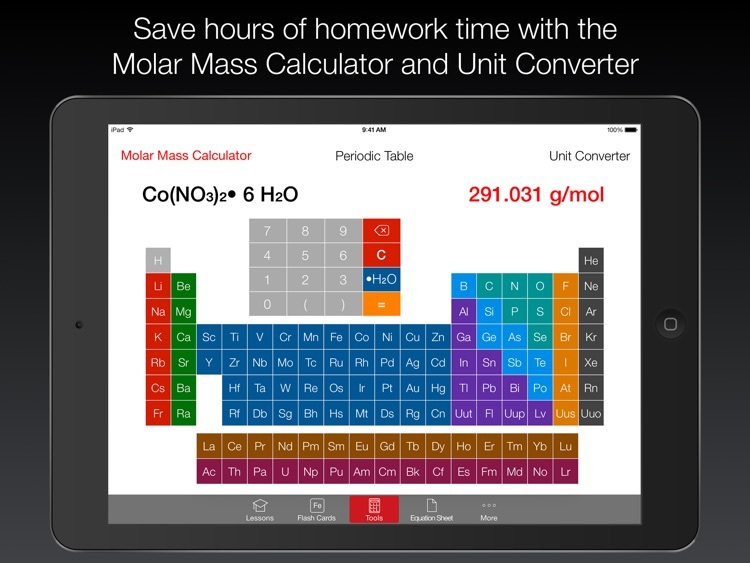 It also includes nine sets of flash cards for memorizing all the needed elements and polyatomic ions, as well as some essential tools - a periodic table, a molar mass calculator, a unit converter, and an equation sheet, allowing you to save an enormous amount of time doing homework problems. See what thousands of high school and college students around the world have been raving about. This life saving app is now available for the iPad! Lessons: Struggling in your current chemistry course? Perhaps you need to review some material for an upcoming exam? 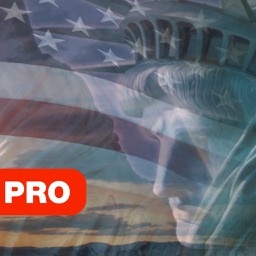 Chem Pro contains over 31 hours of lesson videos, which makes it the perfect companion to have after you step out of the classroom. These lessons are dedicated to teaching students how to solve problems, the most important skill to master in order to excel in chemistry. In the videos, students are shown problems that are solved stepwise at a slow and easy to follow pace. The lessons don't just cover one example problem per topic, they cover all the possible problem scenarios that you would encounter in your homework or in an exam. Every topic is covered, from calculating molar masses to drawing Lewis structures to equilibrium. 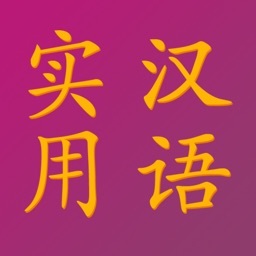 The first 10 lessons are bundled with the app for free and if you wish to continue learning, you can purchase the next pack of topics. Lesson videos are downloaded and saved to your iPad so you don't have to stream anything on the go. 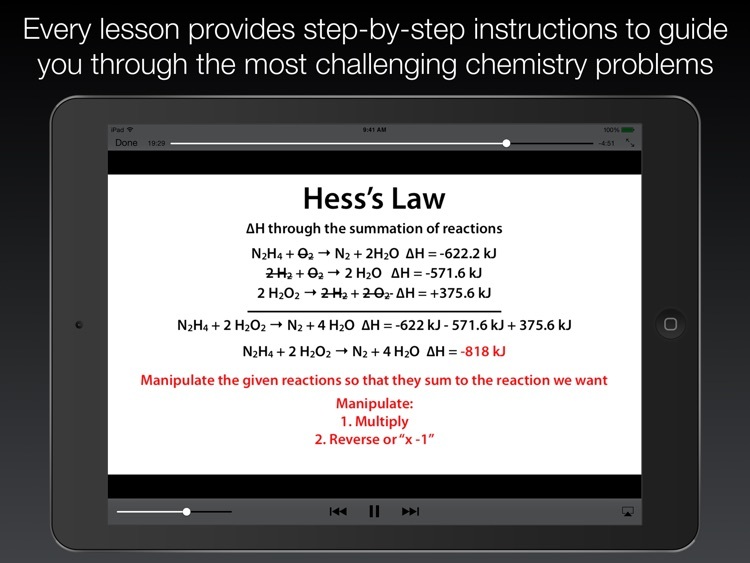 Every lesson is encoded in 720p so they look amazing on the iPad's large display. In addition, lessons always resume right from where you left off, no matter how long it has been since you last watched. You can truly learn whenever and wherever you go. Flash Cards: Chem Pro contains nine sets of flash cards specifically designed for what any student needs to memorize for a standard chemistry course. With these flash cards, you can easily memorize 42 basic elements, 42 common polyatomic ions, common acid names, chemical colors (specifically for the AP Exam), and the 13 VSEPR molecular geometries. 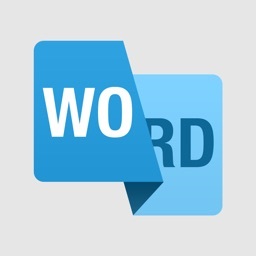 Simply select what you would like to memorize from the list of flash cards to begin memorizing. Just tap on each flash card and it flips around to show you the answer. Swipe back and forth to go to the previous or next card. It's that simple! What's even better is that every time you go to a flash card set, it automatically shuffles the order of the cards so that you can quiz yourself to make sure you know the material. 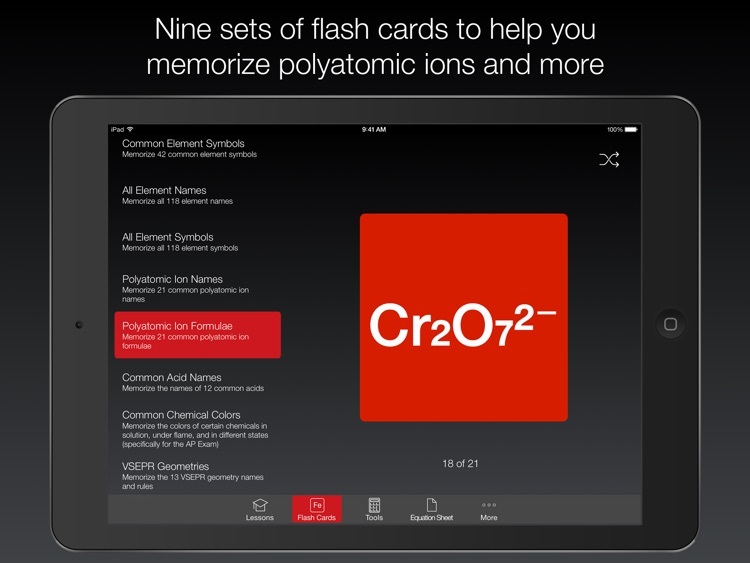 This great feature can save you hours of time making index cards to memorize tedious chemistry concepts. Tools: Chem Pro contains four essential and time saving chemistry tools. Use the periodic table to quickly look up information on any element. The equation sheet contains all the needed chemical equations, laws, and constants that you will find throughout your course. 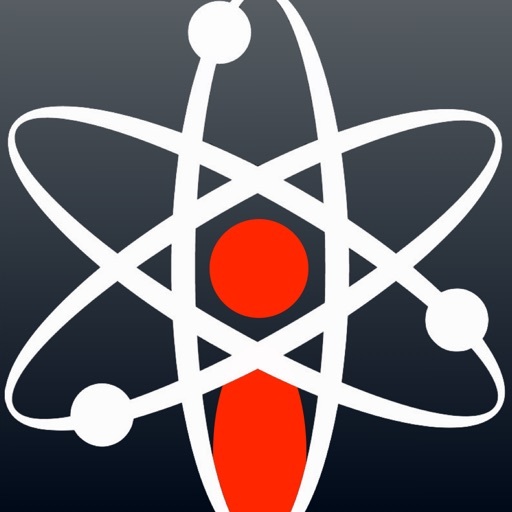 With the molar mass calculator, simply scroll and tap the elements in your molecular formula to quickly determine molar masses. The most commonly used elements are conveniently placed at the front of the calculator and you can tap the same element multiple times to add more in your formula. The unit converter contains all the standard units for length, mass, volume, temperature, pressure, energy, and time. Type the number and the select the unit you want to convert from and you are automatically presented with a choice of conversions.